Golden Plains Community Hospital has a diverse and colorful history - one to match the county and city in which it resides. Borger's first two-story city/county hospital was built in the mid-1920s on the corner of Sixth and Weatherly. It had eighteen rooms, several large wards, an operating room, X-ray room, kitchen, dining room, and doctors' and nurses' living quarters. 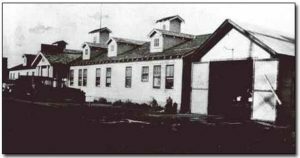 The new hospital was opened prematurely on December 8, 1927 when a dynamite blast destroyed a half-block of businesses and people were injured from the flames. This building was eventually converted into an apartment building. The name of the county hospital was changed to North Plains Hospital while city and county officials were drafting plans for a new facility. The Borger Chamber of Commerce led the drive to locate the land, which later was donated to the county by Mr. and Mrs. J.F. Weatherly, early Borgans. In 1937, the residents of Hutchinson County voted a $65,000 bond issue into play to establish a 25-bed North Plains Hospital. Local merchants and service clubs purchased most of the original furniture and equipment for the new hospital. It was constructed by C.S. Lambie at 200 S. McGee in Borger, Texas at a cost of $58,000. 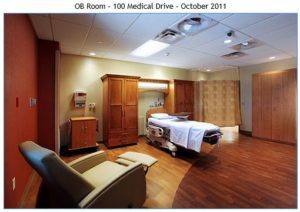 Orvis Dean Box was the first baby to be born in the new hospital on October 26, 1937. In 1941, there was a housing shortage in Borger, so in February of that year, the nurses' home adjacent to the hospital was added at a cost of $17,900. 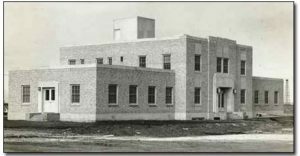 In 1943, two wings were added to the hospital at a cost of $71,300 and in 1947, the two-story center wing was built at a cost of $148,683 plus $23,900 for a central heating system. In 1958, the hospital, which served over 50,000 county residents, boasted 25 maternity beds, 40 surgery beds, and 25 miscellaneous beds. Over 100 people were on-staff and 15 physicians served the community. In the late 1950s, the hospital again underwent renovation. On February 1, 1984, North Plains Hospital was sold to American Medical International (AMI). AMI planned on spending $5 million on renovation of the facility above and beyond its purchase cost of $6 million. According the the June 21, 1984 edition of the Amarillo Globe News, "AMI took over the hospital until May 18 after a referendum on Jan. 21 showed 79 percent of the voters approved sale of the county-owned facility." After taking over the facility, AMI conducted a contest among county residents to rename the hospital. Diana Cline of Borger won the contest in May 1984 with the name, Golden Plains Community Hospital. In 1986, AMI sold GPCH to Gateway Systems who undertook operations until September 27, 1988 when the hospital's doors closed due to Gateway's financial difficulties. Local citizens, led by Borgan Jerry Waggoner, took up the cause and held public meetings to discuss the need for a community hospital as well as alternatives. The committee worked diligently to inform the public about the option of bringing the Hutchinson County Hospital District into being. On July 8, 1989, Hutchinson County voters passed the Hospital District issue with a five to one margin. After Hutchinson County Hospital District became a reality on September 5, 1989 at noon on the steps of the Hutchinson County Courthouse in Stinnett, Texas, Hutchinson County Commissioners appointed the first Board of Directors: Jerry Waggoner, President; Jack King, Vice-President; Mark Mayberry, Secretary; Dr. Dane Welch, member; Dr. Ed Quiros, member; Tambre Lumpkin, member; and Deborah Summers, member. The hospital officially opened its doors for business on November 13, 1989. The District purchased the hospital building for $2.5 million from Irving Trust Bank in New York City, who had obtained the building from the Gateway Systems foreclosure. 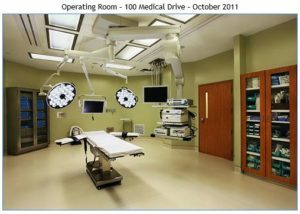 Brim & Associates was chosen as the management firm for the hospital in order to oversee the operation of the hospital. The firm managed GPCH until 1995. The hospital was then manged by its own administrative team. In 1996, Hutchinson County Hospital District took over the operation of the Women's and Children's Clinic, which had previously been a project of the Texas Department of Health. 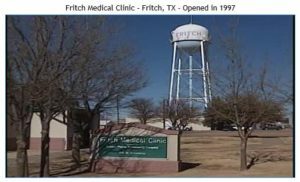 In 1997, the District built the Fritch Medical Clinic in the the nearby city of Fritch, Texas. The old nurses' residence was torn down in 2000 and a new 6,000 square foot building, Golden Plains Medical Plaza at 202 S. McGee, was constructed. 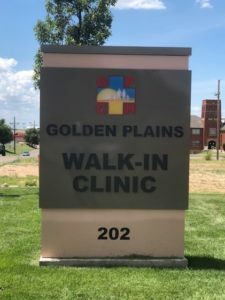 Two physicians conduct their practices in one suite of the building and Golden Plains Walk-In Clinic, which is both urgent care or primary care, operates in the other suite. 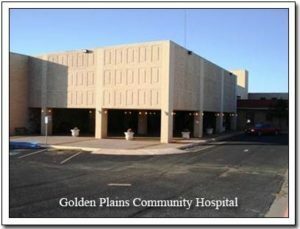 In October of 2007, Critical Access Healthcare, LLC, acquired ownership of Golden plains Community Hospital. The Hutchinson County District (HCHD), partnered with CAH. CAH assumed the operational responsibilities of managing the hospital. The District continues to assess taxes and pay for indigent care for the citizens of Hutchinson County. CAH gave a commitment to the Hospital District to raise the money to build a new hospital to replace the original hospital, portions of which were build in the 1940s, 1960s, and 1970s. 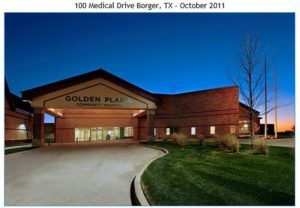 On October 24, 2011, a new state of the art hospital was opened at the hospital's current location, 100 Medical Drive in Borger. The new building is owned by HCHD and financed with USDA revenue bonds. CAH runs and operates GPCH through a lease agreement from HCHD. The new facility contains 15 medical/surgical beds, 7 obstetrical beds, and 3 ICU bed (total of 25 beds), two surgery suites, and endoscopy suite, a day surgery center, full service laboratory and radiology (including a 64-slice CT Scanner, ultrasound, digital mammography, digital fluoroscopy, MRI, and bone density services). The facility also includes rehab capabilities (PT/OT/ST), wound management, a level IV ER/trauma facility, swing bed capabilities, and a separate Specialty Clinic that opened in November 2013. The Specialty Clinic houses two OB/GYN clinics, Borger General Surgery, and Borger Orthopedics. In addition, the hospital operates the clinic in Fritch, TX.